The SEGA Shop Bundles Are Arriving! If you were one of the quick and fortunate few to snap up one of the limited edition IDW Sonic Bundles on the SEGA Shop, keep an eye out for your delivery soon! Shipments for the exclusive bundle first announced at the Sonic SxSW panel earlier this year began shipping last week and should be arriving for most customers this week. 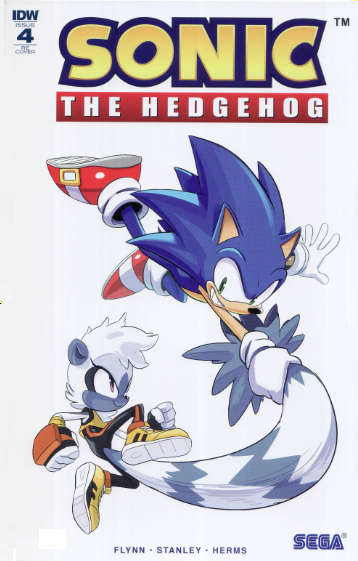 The bundle included the A covers by Tyson Hesse for the first 4 issues of the new on going series along with an exclusive variant of issue #4. Shaking up the pattern a bit, the variant is Hesse’s #4 cover with a white background, similar to the 2nd printings of the previous 3 issues. Meanwhile releasing on the 30th, the 2nd printing of issue #4 will also feature a white background, but with different character art by Evan Stanley. Likewise, the bundle contains a “mystery” t-shirt which is grey and features the same character art as the variant cover. Additionally, the SEGA Shop mailed weekly codes for digital copies of each of the first 4 issues. Despite signing up for tracking updates, I received none, something that seemed to be a common issues amongst customers. It appears tracking codes were made available to those who contacted the SEGA Shop with their concerns. I received the bundle in a bubble mailer with the comic books inside a cardboard mailer. The comics were somewhat dinged up with minor dents and corner damage. Unfortunately, this was most evident on the white cover of the variant. The variant copy itself has a more robust cover stock and also features several additional pages of adds, including a promotion for the first IDW Sonic trade paperback, Fallout!, collecting the first 4 issues to be released this September. Previous Tidewater Comic Con Starts Tomorrow! Next BumbleKast #68: Mega Drive No More?